Olympic Rubber Plates, 25 lb. Rubber Olympic Plates, Available in 5, 10, 25, 35, and 45 lb. increments. 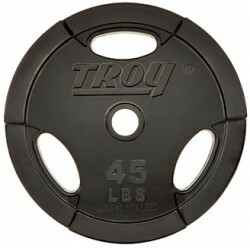 Plates in 5 and 10 ..
Olympic 2" Black Solid Bumper Plates with steel insert. Don't see the set or increment you ar..
Urethane Encased Plates, 35 lb. High Grade Urethane Encased Plates (Does Not Have Grips), Available in 2.5, 5, 10, 25, 35, and 45..
Machined Gray Wide Flanged Olympic Plate, 100 lb. High Grade Fully Machined Black "Wide-Flanged" Olympic Plates, Gray Can't find the set or inc..
Olympic Rubber Plates, 35 lb. High Grade Fully Machined Black "Wide-Flanged" Olympic Plates Can't find the set or increment..
Urethane Encased Plates, 45 lb. Olympic High Grade Machined Plate, 5 lb. Olympic High Grade Machined Plate Plates in 2.5, 5 and 10 lb increments not available with mo..
Olympic Rubber Plates, 45 lb. Solid Rubber Bumper Plate, Black, 15 lb. Solid Rubber Bumper Plates in Black. Available in: 10, 15, 25, 35 and 45 lb. Don't see the se..
Rubber Encased 1" Plate, 5 lb. Rubber Encased 1" Grip Plates. Grips do have molded handles. Don't see the set or increment y..
VTX Pro Series Olympic Rubber Wide Flanged Plate w/o Grip, Available in 2.5, 5, 10, 25, 35 and 45..